It hasn't been a good year for rapper Gucci Mane, who has faced everything from drug addiction woes to an arrest for carrying a gun and weed to huge probation violation troubles. Just when it looked as if it couldn't get any worse, it did — today (December 3), the rapper was charged in a U.S. federal court and is facing up to 20 years in prison. According to the U.S. Attorney's Office for the Northern District of Georgia [via CNN], Gucci Mane, born Radric Davis, was charged with two counts of possessing a firearm as a felon, following two separate incidents in September where he showed a gun and threatened police. On September 12, 2013, Davis, who was a felon at the time, was found in possession of a firearm.... Then, just two days later, on September 14th, he again possessed a firearm different from the earlier gun. On both occasions, Davis displayed the loaded firearm, acted erratically, and made threats to individuals, including police and his attorney. Atlanta Police Chief George Turner added, "We cannot tolerate convicted felons ignoring the law by carrying firearms and endangering our citizens." 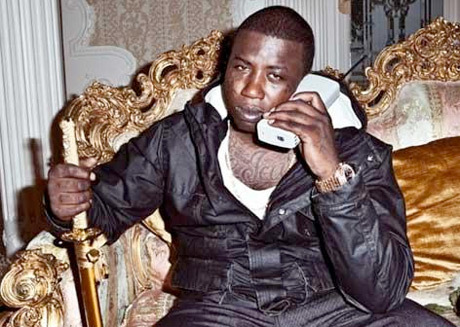 Each of Gucci Mane's two charges carry a maximum sentence of 10 years in prison and a maximum fine of $250,000. That means that the rapper could potentially face a maximum of 20 years in prison. It's unclear when the rapper will receive his sentencing, but it might be a good time to fish out that old "Free Gucci" T-shirt.